with my study of the Bible!! What is Bible Journaling? It's a way of studying the Bible, and expressing what you want through your own words, sketches, stenciling, images, painting, stamping etc. You are adding your thoughts and research notes to the Bible margins, or a notebook. There are several different Bibles that are made with wide margins for note-taking. When we first begin Bible journaling, so many of us don't know where to start. Do we begin with a word, a favorite Bible verse, a search for help in a crisis, an expression of thankful praise? Are we SUPPOSED to actually write in our Bibles??!! There's no specific answer - each person approaches journaling in a different way - some boldly, some timidly - some in their Bibles, some in notebooks. We must remember that ANY time we spend in the Word is time well spent. 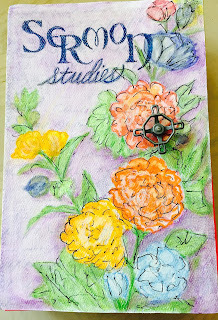 Journaling is such a joy - no experience required. When I began, my first idea was to go by a theme such as faith, prayer, heaven, etc. and I do that occasionally -- researching, then writing. Now, I've determined that the most natural place to start is with each Sunday's Sermon at my church. The Pastors spend the research and time to bring us a message inspired by God. Shouldn't I take that home and ponder it over the coming week? I wasn't doing that. I was doing a disservice to God and my Pastors. I started taking notes, (fortunately we also have video/audio opportunities of that week's message available to us the next day) doing my own research, and writing my thoughts. When we began the Women's Bible Journaling group at St. John Lutheran Church, we began with the study of Jonah, rather than the sermons. It was kind of a "test" study group to see what developed. Jonah is such a rich book to study....so much in those few pages - - my notes and embellishments started to fill up that section of my Bible. I was so nervous to begin this Bible class but I had a wonderful group and co-leader. The ability to discuss the studies together, i.e. what verses were especially meaningful to each of us and why - is such a special way to create a bond with the others. We bring new insight to each other's studies. Once our discussion ends, I demonstrate a new art technique or two for the remainder of our 3-hour time together, sharing, talking and creating - all of us in THE WORD! So many benefits: Our Pastors have really interesting sermon series......I have new sisters in Christ, I get to teach, AND I get to combine that with the art that I love doing. If you want to do something like this with your friends or in a group, let me know if I can help in any way. If you are in the area of Rochester, Michigan (even just visiting), you are welcome to join us, even if it's just for one session. We'll begin again in October - usually the 3rd Saturday of each month. great article to explain just what this is about- thanks!